How has digitization changed the face of Indian retail? With better bandwidth, greater internet connectivity, and an array of digital instruments like credit cards, debit cards, online payments, UPI, and e-wallets gaining traction, the digital impact on retail had just about begun. When the Modi government announced demonetization in November 2016, it was purported to be a ploy to flush out black money from the system. However, it had another positive rub-off. 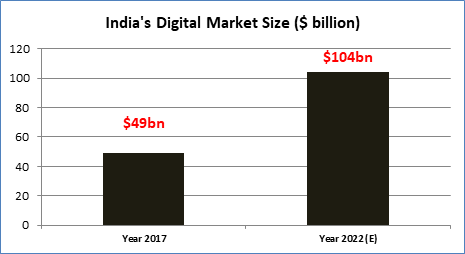 The demonetization exercise gave a big boost to digitization. With better bandwidth, greater internet connectivity, and an array of digital instruments like credit cards, debit cards, online payments, UPI, and e-wallets gaining traction, the digital impact on retail had just about begun. Check the market opportunity in the graph below. The above chart captures the huge potential that the Indian FMCG sector, which is one of the biggest components of retail, has over the next few years. What is more interesting is the shifting demographics. It is this demographic profile that is really interesting. 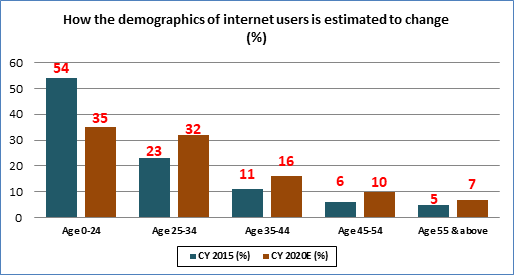 Going ahead, the rise in the number of internet users will not just be driven by the youth but by progressively older people. That has wider ramifications for the way the digital market needs to be imagined and also the way it has to be serviced. Let us see what this means. There have been massive changes in the retail industry just in the last five years, but that is just the tip of the iceberg. What could happen in the next 10 years may be a lot more critical? As an increasing number of customers opt for digital, companies will be forced to change their strategies. 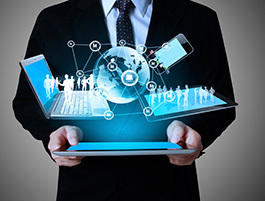 Let us look at some of the seismic digital shifts. This is one area where there is going to be the biggest shift. In traditional retail, the focus was either on mass selling or, at best, mass customization. In futuristic retail, the focus will be more on narrowcasting, i.e. using of data analytics for micro-segmentation of the customer base. Even in terms of positioning, there is likely to be a big difference. In the traditional model, the focus was on managing the price and the quality of the product. In the new digital model, however, with the leverage of analytics and artificial intelligence, the retailer can adopt for a theme-based approach or a hypermarket model which will be able to deliver products with granular customer characteristics. When Amazon was first launched in the late 1990s, nobody thought it would survive against the might of Barnes and Nobles. But today, Amazon practically sells more books than any retailer in all of history. The shift to digitization may result in a gradual shift from a brick-and-mortar model to a ‘Brick and Click’ model to eventually a ‘Click and Serve’ model. Take some instances: Netflix has perfected video-on-demand to an extent wherein Blockbuster Entertainment had to file for bankruptcy. Similarly, the internet broking model has revamped the way broking services are offered in India. The strategy going ahead will be more of omni-channel marketing with customized feeds, downloadable research at a granular level, and on-demand products through a chain of virtual outlets. Amazon has already started using predictive analytics and mailing books based on what could be your next purchase. This is just the beginning and India could see really witness exciting times on this front. Retail will become a model with digital enablers compared to the single-point market that exists today. If you walk into a typical store or a supermarket, the focus of any retailer today is on your in-store journey. How easily you can navigate across products; how to lead you to the right products; and how to reduce your time and maximize return on investment (ROI) per customer. That is the traditional approach. The retail outlets of the future will be like digital kiosks with virtual trial rooms, augmented reality, and the use of artificial intelligence, etc. The idea is not just to optimize the in-store experience but also to offer a combination of aids that can help you to quickly take the right purchase decision. This would be achieved by displaying a high degree of understanding of the customer profile. In the traditional model, the focus is more on helping you navigate the touch-points with ease and designing the store layout accordingly. The store of the future will be all about a total physical and digital experience and focus on the customer journey. For example, can you get alerts the moment you set out to shop? Can you get useful add-ons like matching shoes, the perfect cufflinks, etc.? This may not look like a big potential now but could be powerful in the future. For example, loyalty programs will no longer be about coupons and stamps. Instead, it will be an app-based program which you can conveniently download onto your mobile phone. The retailer can create a complete ecosystem of a virtual network where the focus will be more on cooperation than on competition. Apart from the loyalty programs, even pricing policies are likely to be impacted by digitization. Traditionally, pricing has been more of a structured process with marginal variations. The decision has still been centralized. In the new retail structure, the pricing is likely to be more dynamic and more granular with intelligent dynamic pricing becoming the norm. In a nutshell, the impact of digitization on retail has just about begun. The real excitement should begin anytime in the coming future.